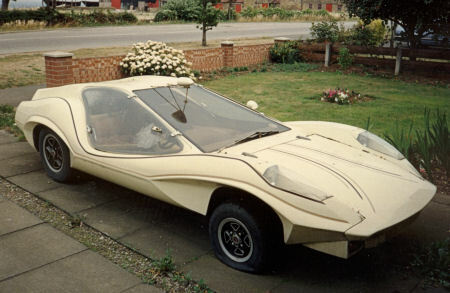 The Centaur was built by Concept Cars Ltd. in Northampton from 1973 on. Sold: 1974-1977. The design was heavily based on a styling exercise of the Adams brothers: the Probe. In fact, they passed their project on to Peter Timpson of Concept Cars, who marketed their idea made more practical. In 1970, Timpson had acquired the second Probe 15 bodyshell and modified it considerably. He widened it and height went up to 37". The major change was a pair of perspex windows which doubled up as doors. Imp basis remained, and body was a tough GRP-and-plywood monocoque with box section and steel tube reinforcement. A high quality construction. Some 52 cars were sold, at the most. Maybe the production number of 26 is Centaur only, and perhaps the number of 52 includes the Pulsar ? 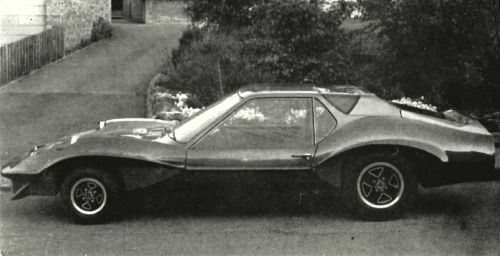 The Centaur Mk2 of 1978, a 2+2 version, was developed, but the project passed to Mirage as the Pulsar. Only one larger Centaur was built: the Timera. 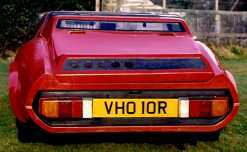 It had a midmounted Leyland Maxi 2.2 engine, and a complex multi-tubular chassis (designed by Frank Costin) with de-dion rear suspension lay-out. 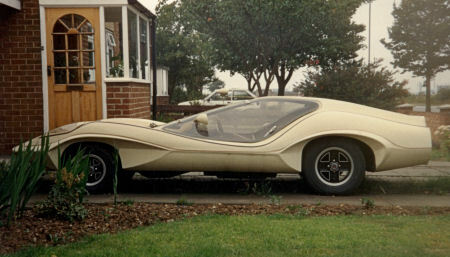 The glass fibre bodywork (design and construction: Peter Timpson) made its family relation to the Centaur very evident. The Condor roadster remained a dream. So from the moment you slide into the tailored, deep contoured seat, fasten your harness and accelerate away, you and your Centaur become a single unit. You will feel the car respond to your touch as firm support, finger tip switches, immediate response from the arm length wheel combine with superb road holding and acceleration to provide a new dimension in motoring excitement. And the envious looks make even a traffic jam an ego-boost. But quality is important too, and Centaur aims for the highest standards in style, performance and pleasure. This means doors that don't leak or rattle, heaters that heat, it means a luxurious interior and a solid exterior. It means 100+ mph performance and 50mpg economy. Above all in a kit form car it means a jig drilled chassis, all mounting points fitted, no exotic hard to obtain parts and additional unexpected costs. It means that we take the trouble to ensure that you enjoy building your Centaur as much as driving it. And if you don't want to bother, we will build you a completed car. Basic GRP/Ply/Steel monocoque with integral seats, roll hoop, fiited with windscreen, sidescreens, and all body panels. Rear engined two seater sports car with full integral roll structure. Large flat windscreen in laminated safety glass. Luggage space behind seats. Front boot. Petrol tank. Perspex sidescreens giving wide angle vision, and hinged at front leadign edge to give access to car interior. Removable rear deck for easy engine accesibility. Lather covered aluminium steering wheel. Instrumenmts and switches fitted. Gearstick and handbrake between seats. Fully upholstered and carpeted. Wiring loom, hydraulic pipes, wipers and washers all fited. Quartz halogen headlamps with sidelamps, front and rear indicators, stop/side tail lamps. Finished in your own choice of any manufacturers colour. Heater and ventilator. All other components excluding engine/transaxle, suspension, radiator, battery, wheels and tyres. As Stage Two body chassis unit plus engine etc. to complete as a running car. Brakes Front drum (leading shoe): 8in dia. Rear drum: 8 in dia. Concept Centaur has no connection with any other car or company of the same name. Concept Cars Ltd. reserves the right to change prices and specifications at any time without prior notice. A thoroughly practical sports car sounds like a contradiction in terms, but we believe the Centaur Mk II to be just that, combining practicality with the sort of styling that is associated with cars costing over £10,000! Its unique qualities bring back real excitement to modern driving. A combination of low frontal area, carefully developed aero-dynamics and the relocation of the Imp suspension pick up points, coupled with low centre of gravity, and the matched contact area of the Avon 'Wide Safety' wheels and tyres gives incredible cornering power and excellent acceleration and braking characteristics, which, along with superb vision, result in very high average speeds. Finally: Not only can you afford to run and maintain the Centaur Mk II, YOU can afford to BUY it! 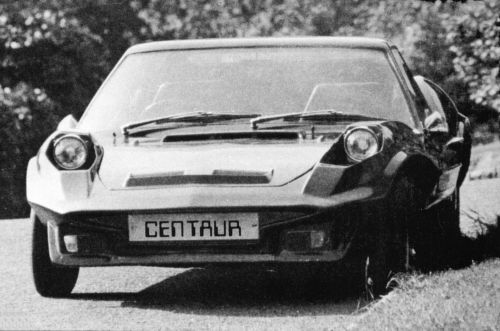 CONCEPT CENTAUR Mk II. COMPLETED CAR. Built to your individual requirements. Comprising of: Dash/interior panel in textured G.R.P., two seats upholstered in P.V.C. and corduroy, headlinings, carpets cut to shape, door trim, hand brake and gear shift gaiters. Price £53.00 ex. V.A.T. Comprising of: As above except seats upholstered in leather/fur or sheepskin, fur lined rear compartment, all other panels padded and upholstered in P.V.C. and leather gaiters. Price £72.00 ex. V.A.T. The extremely strong and rigid monocoque chassis is made from top quality G.R.P. in our own workshops. We pay a great deal of attention to the structural strength of the car, with steel and ply reinforcement as an integral part of the design. No exotic or expensive parts are required to complete your Centaur Mk. II, as virtually everything you need comes from the Chrysler Imp range. The final specification is your own choice, even when using the standard Hillman Imp mechanical components for your car, very few production sport cars will exceed your Centaur's performance, NONE will compete with fuel consumption figures! Our basic kit price is higher than most, but it is a true price, no additional 'extras', e.g. hardtops, floorpans, side or windscreens, etc. to buy. The Stage I kit comprises of: the jig- drilled body/chassis unit, all windows (including windscreen), body panels, doors and mounting beams - in fact everything you will need on which to base your car. We even carry this a stage further: the Stage II kit needs only engine, transmission, radiator and running gear to complete the car - all of which can be fitted in a week-end! In either case no special tools or specialist mechanical knowledge are required, the kits are designed so that the average enthusiast can easily produce a car to be proud of. Each completed Centaur II can normally be registered as a new vehicle but if you want to, you can retain your existing licence plates. There are Extras and Accessories available! (See enclosed order form). Proprietary parts we will normally supply to customer requirements, at a discount. (Tyres fitted and electronically balanced by Avon). *N.B. These items are only required by Stage I Kit builders. inc. VAT & p. & p.
Concept Cars Ltd. reserve the right to change specifications and prices without prior notice. Prices will not be increased after deposit has been paid. Deposits not normally refunded. 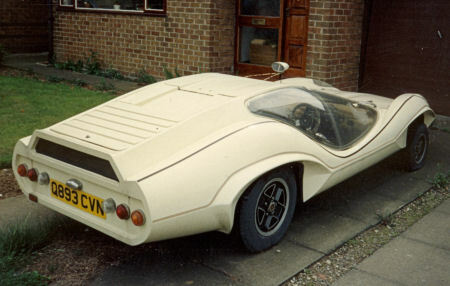 It is said that the Durango 95 of 'A Clockwork Orange' (Stanley Kubrick, 1971) is an Imp-engined kit-car, perhaps a Centaur. The film shows a futuristic society and a futuristic car was called for. It's night in the scene that shows the car and you can't see it very well. Perhaps it's a Probe 16, but it is not a Centaur Mk 1.
it's incredible. fast, REALLY speedy, funny. sharp cornering, right. same as a good cx gti. the centaur does not bump or shudder, it just ignores the uneven ground, the stones and the puddles, and circles around corners. man, it's really a mad go-cart. only when you drive really slow, like walking, you feel it moving more. i think it's because of the low weight. the imp's engine really does an easy game with this 'plastic fantastic'. there is almost no difference in the speed with which the engine revs up, whether the gear is in neutral or in first, only in the last case, the car accelerates fast. the centaur's weight is just nothing but ignored. it takes almost the same time to reach top rp/m. really cool, i did not have soooo much freaky fun for 3 years or so. 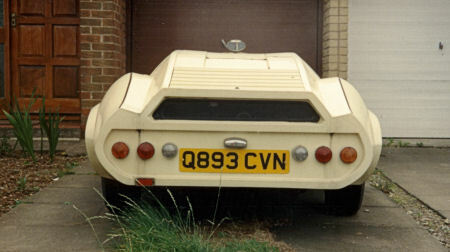 Journalist Chris Rees had a Centaur Mk 1 and wrote (more than?) 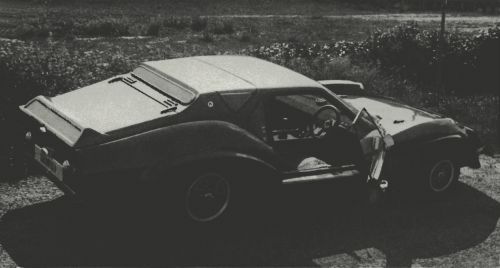 one article on it in 'Kit Car'. Steve Groves bought a Centaur that he bought via Ebay. It is the first one made! Carsten Bussman still has one, a 1975 Centaur Mk. 1. He is into getting parts remanufactured, like the (macrolon) gull wing doors or the lamp covers. He says he knows almost evry owner and he thinks there may be no more than 17 alive, maybe fewer than 10. In 2007 in Sweden the ex-Chris Rees Centaur came up, red car. Chris Crudwell had his 1974 Centaur Mk. 1 on Ebay October 2005.
a reconditioned 875cc imp engine; spliced rubber drive shaft couplings, a (�120) replacement safety glass windscreen, 3 point harnesses, piper cross air filter, spot lights, and various reasonably recent parts including mechanical fuel pump, battery etc. It is totally original and has head light perspex covers (although one does have a slight crack), the original engine cover and curved gull wing doors and external roof mirror etc. I've had it for about 6 years, although due to being at uni it has been SORN since 2001 and garaged. Today I got it running with no real problems and everything, to my surprise, works - all indicators, lights etc etc. She drove into the garage with mot and I think with some basic checks she's fine to get road legal again. The daughter, Eloise Timpson, is not indifferent. Terry Shears was the one to originally built VH0 10R. He still holds it very dear.